In the summer of 2008, I was working at my alma mater while preparing to start culinary school at Johnson & Wales University-Charlotte in the fall. Gas prices were high and I was taking the bus to save a little money on my commute. The 40-minute trip provided ample reading time and that summer I didn’t go anywhere without some sort of culinary tome on my lap. I read cookbooks, memoirs, and food essays and along the way stumbled upon the food writer John Thorne. John Thorne is no Food Network star or glitzy restaurant chef. He is simply a man who delights in cooking and eating. His essays are approachable; they invite anyone with a good appetite to find their place at the stove. Sitting on that bus and reading about him unabashedly scraping the last bit of marrow out of a beef bone was an epiphany of sorts for me. I remember thinking that the way he wrote about food was the way I wanted to cook it: with unassuming integrity and great joy. I follow Molly Wizenberg’s blog Orangette and was delighted to find a reference to John Thorne’s method for cooking dried beans in a post last month. While dried beans may not seem worth the trouble to many, to make them with care by gently cooking them in a low oven for hours embodies Thorne’s culinary approach and I was eager to try his method. This week I finally got around to doing it. I sorted, rinsed and then soaked a pound of dried navy beans overnight and then let them slowly cook for almost 6 hours. Instructed to stir the beans occasionally, I failed miserably at that job opting for taste-testing spoonfuls instead. Before you find fault, attempt to think straight when you lift the lid and are hit with the steamy aroma of slow-cooked garlic, sage, olive oil, and beans. You too will be distracted. The reward for my patience was plenty of beans for baby, the freezer and this Escarole, Chicken and White Bean Soup. Decidedly uncomplicated, this straightforward soup yields big flavors despite its simplicity. Paired with a chunk of Jim Lahey’s no knead bread it’s a satisfying dinner that I like to believe Thorne would be pleased to have on his table. Happy cooking! 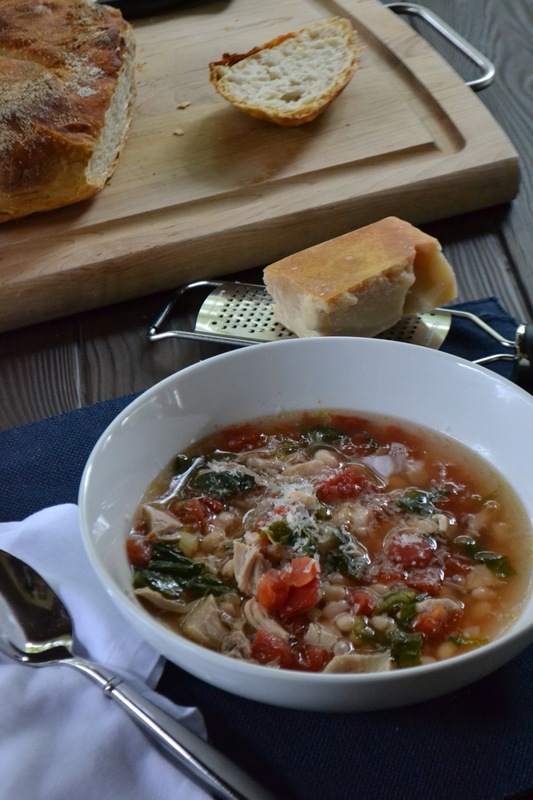 Using two (15-ounce) cans of white beans in place of the cooked beans below will bring this soup to the table more quickly although flavor will suffer for it. If making beans from scratch, a ½ lb of dried beans is enough for this recipe although when going to the trouble I like to make a full pound. 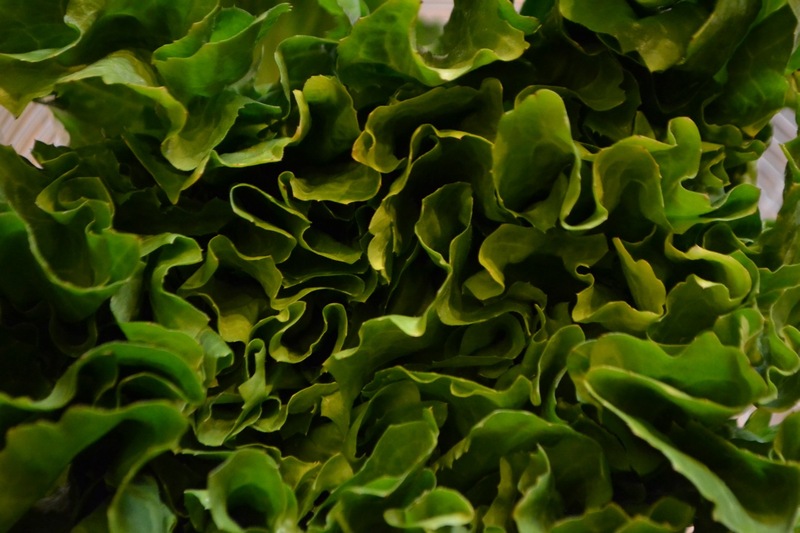 I sprinkle the leftovers on salads, purée them with olive oil into a yummy dip, freeze them for later use, or eat them straight from the pot – they are that good. Instructions for John Thorne’s method of slow-cooking beans as detailed by Molly Wizenberg are found here. I doubled the amount of beans used, omitted the red hot chili flakes, and doubled the salt, pepper, and garlic called for in the recipe. I added a generous pour of extra virgin olive oil and threw in a sprig of sage. It took almost six hours for the beans to be tender, but the resulting texture was worth the wait. 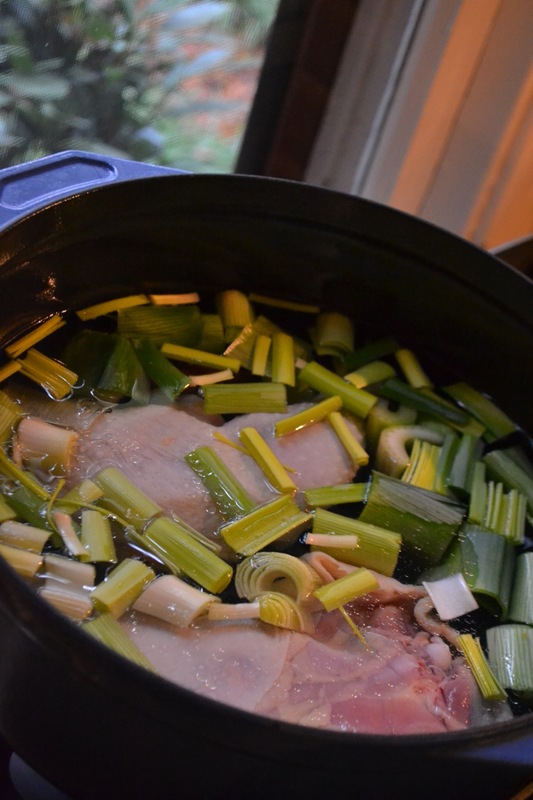 In a large heavy-bottomed pot, combine the chicken, leek, carrot, celery stalk, bay leaf and water. Bring to a boil over medium heat, skimming off any scum that floats to the surface. Reduce the heat to a low simmer and cook for approximately one hour. Remove the chicken from the stock and set aside to cool. Strain the stock and discard the vegetables and bay leaf; you should have about 6 cups of stock remaining. When cool enough to handle, remove and discard the skin from the chicken and shred the remaining chicken into small pieces. Discard the chicken bones. You should have about 2 cups of meat. Combine the cooked navy beans (be sure to include some of the cooking liquid), the roughly chopped Escarole, the shredded chicken and diced tomatoes to a large, heavy-bottomed pot. Add about 5 cups of the chicken broth* to the pot and bring to a simmer. Let simmer for 15 minutes and then season generously with salt and freshly ground black pepper. Enjoy sprinkled with freshly grated Parmesan, a loaf of crusty bread, and good company. *Note: Freeze leftover stock for use in future dishes.